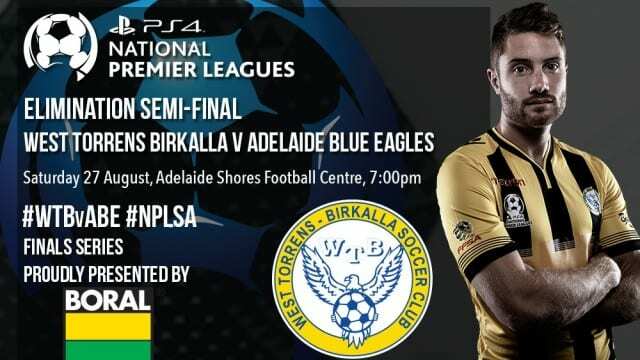 After negotiating the first week of the finals, West Torrens Birkalla and Adelaide Blue Eagles face another must-win encounter in the PlayStation 4 National Premier League South Australia Elimination Semi-Final at Adelaide Shores Football Centre on Saturday night. West Torrens Birkalla progressed to this stage thanks to Paul Radice’s goal in a slender 1-0 victory over MetroStars. Coach Steve De Giovanniello said the result helps build Birkalla confidence. “It was a very tense and tight game,” he said. “We started well, but MetroStars finished the better side and were probably unlucky to not get something. But we defended well to go through. Not only did last week’s victory take Birkalla a step closer to the decider, they did so by keeping a first clean sheet since mid-June. De Giovanniello said maintaining that defensive discipline will help the team in what he thinks will be a tight encounter with Blue Eagles. “There is no pressure on us, we are not expected to make the finals or keep going. We have spoken about how close we came last year and what it felt like to lose the Preliminary Final. We know what we can achieve as a group. “We know we must defend as a unit. If we show the same defensive performance as last week it will be difficult for Blue Eagles to break us down. Adelaide Blue Eagles overcame Adelaide Comets last weekend, coming back from a goal down to win 3-2. Samuel Tesfagabr, Mattia Perrotti and Anthony Dimas struck to see Blue Eagles advance. Matthew Dawber said it was good to get one over Comets, after going winless during the season. “It was a very good performance and we played to our strengths,” he said. “We drew with them twice and knew we had to hit them on the counter-attack with our speed. I also thought our midfield beat their midfield. Blue Eagles come into this weekend’s contest having lost just one match in the past seven encounters. However, they have failed to get the better of Birkalla in 2016. Dawber said recent results have added confidence at Marden. “The mood in the squad is very good, we are confident. All the players are working hard at training. If we do that on the day we believe we will win. “Compared to our past matches with them we will have a full-strength side. If we play like we have in the last few weeks we can get the job done.